Was touring with few tourists around K.K. area the other day. Mr. G (who love Sabah and came for trips almost every year) requested to bring his friends to our local fish market and experiencing different kind of local "scenery" in Kota Kinabalu, Sabah. As for Sabahan, we will be asking "Why do those tourists visit such a place?" or even says "What lah those tourists, these kind of smelly place they also like to snap photos." " They can't see such an amazing scene at their town and they LOVE it." And luckily our local fish market have thousand of fishes to be seen and photographs by the tourists during our visiting! From what have I see... for the first time I saw so much fishes in huge and small sizes and even deep sea fishes, prawns, crabs and others laid at all the fish stalls. Yup! 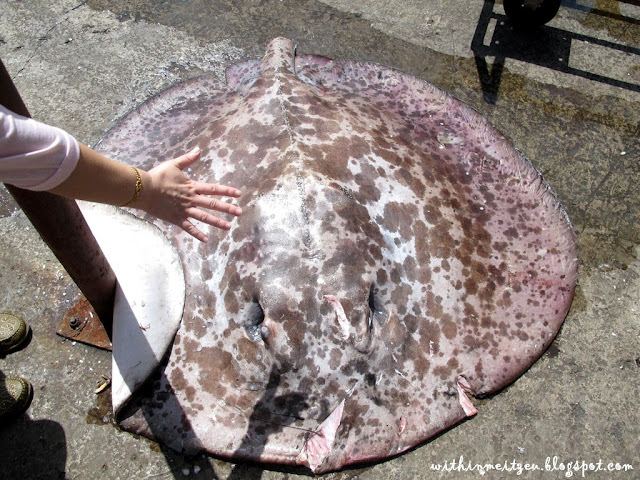 I saw the huge sting ray outside the main entrance of the fish market. It was HUGE totally! *Tour with Tropical Holidays Paradise for local Wet Market in Kota Kinabalu, Sabah. Haha :D yea.. It's beautiful in the sea with them. Just like birds in the sky. Haha yup! Taste good!